What is a furnace/boiler chimney liner? A furnace/boiler chimney liner is your first line of defense against poisonous fumes and destructive gasses. 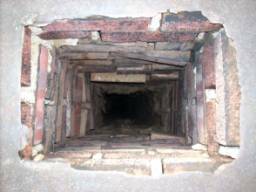 It is a protective material within the chimney flue (the passageway for the smoke and fumes) that works to ensure that the exhaust gasses cannot escape from the chimney and into the home. The liner also protects the masonry chimney from damage caused by these gasses. Older chimneys were not designed to withstand the problems of modern furnaces and boilers. High efficiency furnaces don’t waste energy by sending heat up the chimney. As a result, temperatures in the flue drop low enough to create condensation. This water combines with acids in the flue to create an acid moisture which eats away at the bricks and mortar. Sometimes you will see stains on the outside of the chimney or stains and peeling plaster inside the house as evidence of a chimney liner problem. In older homes that don’t have any liner at all it is possible to have a very dangerous situation: When the furnace comes on, the chimney warms up and becomes wet with condensation. Later, the furnace turns off and the chimney cools down and the moisture freezes. This freeze and thaw cycle plays havoc on the chimney and can cause bricks to come loose and fall down blocking the chimney. If the chimney becomes blocked, carbon monoxide can build up and have nowhere else to go but into the home. Such a situation can become deadly if not recognized and prevented. If there is not an adequate chimney liner, fumes and carbon monoxide can spread into the house. What is the solution to furnace/boiler chimney liner problems? While a fireplace chimney flue requires a stainless steel liner, we can often use a less expensive aluminum liner with a furnace or hot water heater that burns natural gas. Once the furnace liner is installed we can then successfully repair the exterior and crown of the chimney.